P suggested Elevation Burger and I had to shoot him down! 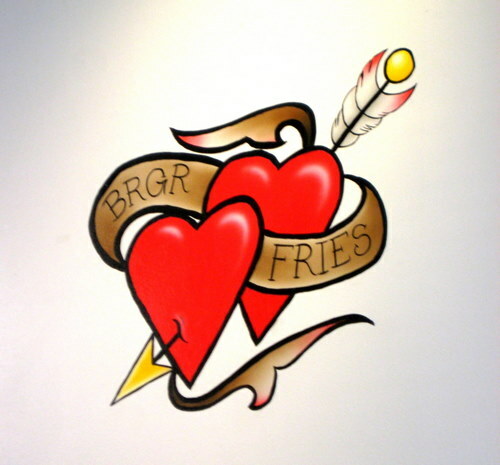 I suggested we drive a wee bit further into Bryn Mawr to check out the BRGR Joint. So we met up to talk shop and eat some burgers. That’s why you come here folks, for the burgers! The place is pretty small, but has plenty of tables. They seem to do a healthy take-out business. They have a variety of burgers and toppings and several lunch combo specials. 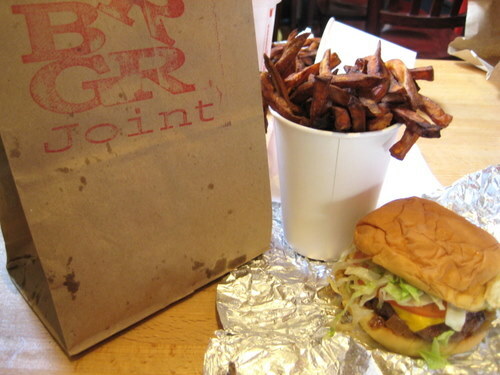 I got the Lil Cheese BRGR meal, because that’s one patty, and I don’t need to do two. I’m a simple girl, so I just got lettuce, tomato, and lots of fried onions as my toppings. You get fries or a salad with your combo, and I went with trusty sweet potato fries. Oh, and for a drink, I got Fanta. They have it on tap. Which is my favorite kind of awesome. P got a burger with two patties, because he eats like a real man, and J got a turkey burger. Why? I don’t know. But he’s always getting turkey burgers! I thought the burger was ok. But frankly, I just wasn’t impressed. The bun is that same bun you can get at the grocery store and the burger part wasn’t all that special either. And I was disappointed by the sweet potato fries, and it’s hard for me to find a sweet potato fry I don’t like! But they just seemed burnt and soggy. I think they’re twice fried so maybe that’s what they’re supposed to taste like, but if so, they’re not for me. I don’t think it’s any better or worse than Elevation. So really, neither of them are really doing it for me. Oh well!